Amaranth [Amaranthus hypochondriacus, A. cruentus (grain type) & A. tricolor (vegetable type)] is an herbaceous annual with upright growth habit, cultivated for both its seeds which are used as a grain and its leaves which are used as a vegetable or green. Both leaves and seeds contain protein of an unusually high quality. The grain is milled for flour or popped like popcorn. The leaves of both the grain and vegetable types may be eaten raw or cooked. Amaranths grown principally for vegetable use have better tasting leaves then the grain types. Originating in the Americas and Europe, amaranth has been cultivated for more than 8,000 years, dating back at least to the Mayan civilization of South and Central America. It was a staple of the Aztecs and incorporated into their religious ceremonies. In the 1500’s the Spanish conquistadors prohibited amaranth production. In that area today only a limited amount of amaranth grain is grown, most of which is popped and mixed with honey to make a confection called, “alegría.” However, much of the genetic base has been maintained there because amaranth has continued to grow as a wildflower. Amaranth consists of 60–70 species, 40 of which are considered native to the Americas. Over 400 varieties within these species are found throughout the world in both temperate and tropical climates, and fall roughly into one of four categories: grain, vegetable, ornamental or weed. Many fall into more than one. Vegetable amaranth has been used in China for over 400 years, yet is commonly found in the Caribbean and Africa; grain amaranth was cultivated and revered by the Aztecs in Mexico, the Mayas in Central America and the Inca in South America. Of the various species of amaranth, three have been selected over the years as the choice for human and animal consumption. A. hypochondriacus (prince’s feather) and A. cruentus (purple amaranth) are commonly grown for grain, and A. tricolor (tampala) is grown primarily for the leaves. 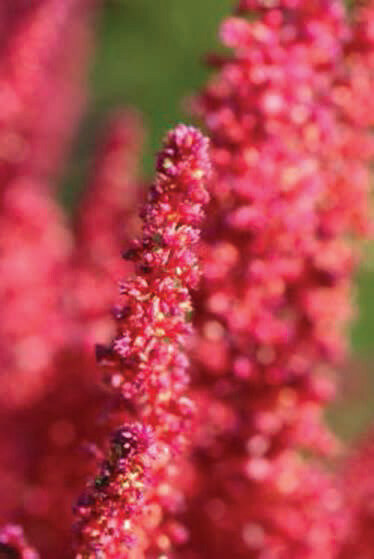 A fourth, A. caudatus (love-lies-bleeding), is a third type of grain species, although is often grown more as an ornamental. When used as a grain type, A. caudatus varieties are best adapted to the tropical highlands. Other vegetable amaranths are represented by A. dubius, A. blitum and A. cruentus (purple amaranth); weedy species are represented by A. retroflexus (redroot pigweed), A. albus (tumbleweed) and A. spinosus (spiny amaranth). There are not many genetic differences in amaranth species. They are easily cross-bred, and even weedy types will cross with the intended crop if not rogued from the field. In a personal conversation, Dr. David Baltensperger, amaranth breeder at the University of Nebraska, shared that it’s possible that amaranths may all be of one species. Because of this, and the fact that cultivation techniques are basically the same for all, we include them together in this technical note. For cultural purposes, grain, vegetable, ornamental and weedy types do have some distinct variations. The leaves and grain of all types are edible and equally nutritious. The seed or grain of the grain type is of a pale color, varying from off-white to pale pink. The seed of the vegetable, ornamental and weedy types is black and shiny. 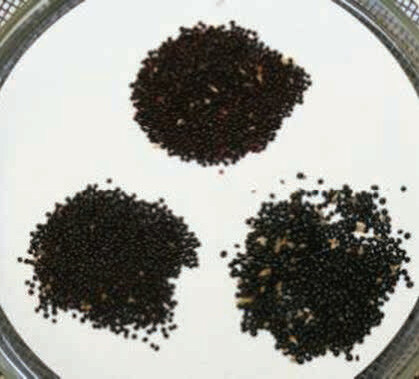 Both types are edible and may be used as flour sources, but if the black seed types are mixed in with the pale types, it is often considered contamination. ‘Viridis,’ A. cruentus ‘R-104,’ A. hypochondriacus ‘Burgundy’ seed variation. Photo by Larry Yarger. Amaranths are tall (0.5–2 m or 2–8 ft) and moderately branched from a main stem. Grain types form large loose panicles at the tips of the stems. Vegetable types form flowers and seeds along the stems. They are indeterminate in growth habit, but may set seed at a smaller size during short days. Grain amaranth grown during the winter months at ECHO (southern Florida) flowers at less than half the height of amaranth sown in May. Grain types may grow to 2 m and produce yields comparable to rice or maize (2,500 kg/ha or 1,000 lb/a). Amaranth has a “C-4” photosynthetic pathway (along with such plants as corn and sorghum), which enables it to be uniquely efficient in utilizing sunlight and nutrients at high temperatures. It is more drought-resistant than maize and thrives in 30– 35°C temperatures. It tolerates poor fertility and drought, although the tolerance mechanism is not well understood. Plant quality, however, is poor under stressful conditions. Amaranth responds well to fertilizer. Amaranth is a highly nutritious food. The leaves, shoots and tender stems are eaten as a potherb in sauces or soups, cooked with other vegetables, with a main dish or by itself. The seed or grain is also edible. Chopped plants have been used as forage for livestock. And, the flowers make nice ornamentals, fresh or dried. Amaranth is not in the grass family, therefore is not considered a cereal grain. However, since it is used much like cereal grains, it is often called a pseudocereal. As with other small grains, amaranth may be processed in popped, flaked, extruded and ground flour forms. In Mexico, the popped amaranth confection, alegría is a popular favorite among locals and tourists alike. The flour or flaked forms are combined with wheat or other flours to make cereals, cookies, bread and other baked goods. Originally it was recommended that amaranth make up only 10-20% of the flour blend, but studies have shown that it can be blended at 50-75% levels and still maintain functional properties and flavor. Coarsely ground amaranth makes a tasty and nutritious porridge cooked by itself or mixed with other grains and pseudocereals such as oats (Avena spp. ), wheat (Triticum spp.) [e.g., Ralston’s®, Cream of Wheat®], milled flax seed (Linum usitatissimum), wheat germ, and cañihua (Chenopodium pallidicaule). Nutritious Leafy Green. As can be seen in Table 1, amaranth is quite nutritious. Amounts of vitamin C, iron, beta carotene, calcium, folic acid and protein are especially high. There are reports that the incidence of blindness in children due to poor nutrition has been reduced with the consumption of 50–100 g of uncooked amaranth leaves per day. On a dry weight basis, the crude protein content in the leaves ranges from 20%–32%. Compiled from J.N. Cole. 1979. Amaranth: From the Past, for the Future. Rodale maus, PA, USA. Oxalic Acid. Amaranth leaves, like some other vegetables, contain rather high amounts of oxalic acid and nitrates. The amount of oxalic acid is roughly the same as that found in spinach (Spinacia oleracea) and chard (Beta vulgaris cicla). Excessive amounts of oxalic acid may reduce the availability of certain minerals in the body, most notably calcium. This could be a concern especially if calcium intake levels are low to begin with, or if foods high in oxalic acid are consumed on a regular basis over long periods of time. Nitrates in amaranth leaves are also a concern since it is hypothesized that nitrates may be chemically changed in the digestive tract into poisonous/carcinogenic nitrosamines. Evidence for this is lacking at the present time. Boiling the leaves like spinach or chard 5–10 minutes, then discarding the water alleviates both oxalate and nitrate problems. Regardless, research has shown that consumption of 200 g of cooked amaranth poses no health problems (Grubben, et.al.). Nitrate is one of the simplest forms of nitrogen. Plants absorb nitrates from the soil and convert them into more complex forms of nitrogen, such as proteins. There are a number of plants that are likely to accumulate nitrates, including lamb’s-quarters, amaranth, spinach, corn, and beets. This happens especially when soil fertility is very high (generally the result of adding nitrogen fertilizer), and when something slows the process of photosynthesis, such as herbicide, drought, or frost. Nitrates are mostly accumulated in the plant tissues and not in the seeds (or not much). Human infants and some animals have bacteria in their digestive systems which convert nitrates to nitrite. In humans, by six months old, the acid levels in the digestive system rise higher and kill these bacteria, and the danger of nitrate poisoning is mostly past, although if you’re pregnant, being treated for cancer, or have low stomach acidity,there is increased risk. Nitrites bind to the hemoglobin in blood, robbing it of the ability to carry oxygen. Since hemoglobin’s function is to carry oxygen, the net effect is oxygen starvation. Symptoms of nitrite poisoning include shortness of breath and reduced immunity to disease, and, in extreme cases, may lead to death from suffocation. This is the cause of ‘blue baby syndrome’. However, almost all documented cases of nitrate poisoning in infants arise not from food, but from high nitrate levels in drinking water. Livestock, though, are frequently poisoned by high nitrate levels in food, possibly due to the lack of variety in their diet. There is a possibility that Vitamin A may (or may not) help counteract the poisoning. Nitrates also combine with some proteins to make nitrosamines, which may cause cancer. (Remember the warnings about bacon?) Whether or not they cause cancer, Vitamin C will prevent the nitrosamines from forming. My [Deb Schwartz of kingdomplantae.net] overall conclusion is that if you’re over six months old, healthy, and have a good diet, you probably don’t have to worry too much about nitrates in your food. However, fertilizers, pesticides, and herbicides are still toxic, so the warning about collecting food or medicine from areas which may have been so treated still stands. Nutritious Grain Crop. Amaranth grain has more protein than corn, and the protein is of an unusually high quality. It is high in the amino acid lysine, which is the limiting amino acid in cereals like maize, wheat and rice. The protein is also relatively rich in the sulfur-containing amino acids, which are normally limiting in the pulse crops (e.g. dry beans). The “protein complement” of amaranth grain is very near to the levels recommended by FAO/WHO. It has a protein score of 67–87. Protein scores are determined by taking the ratio of the essential amino acids to the level for those amino acids recommended by FAO/WHO, and multiplying by 100. By comparison, wheat (14% protein) scores 47, soybeans (37%) score 68–89, rice (7%) scores 69, maize (9%) scores 35. Although amaranth is theoretically close to the ideal, combining it with another grain increases the quality to very close to the FAO/WHO standards. Nutritious Animal Feed. The raw amaranth grain contains toxins and anti-nutritional factors that can reduce its effectiveness as an animal feed. Dr. Cheeke related in a personal communication how a scientist in Australia fed raw amaranth grain to poultry as the major component of the diet. As a result the chickens went into convulsions and died. An unidentified toxic factor had caused liver damage leading to the death of the chickens. Amaranth also solves the problems of formulating hog feed without using often prohibited animal protein. Zraly, et.al. (2004) utilized the quality of the amaranth protein, particularly because of the amino acid lysine, to formulate a complete feed ration using both grain and plant biomass to successfully fatten hogs. A. hybridus and A. retroflexus have been successfully incorporated into feed for calves and sheep as forage, with the results obtained not significantly different from that of alfalfa. Pond and Lehmann (1989) reported that the leaves from A. cruentus provide balanced forage high in crude protein, low in cellulose and toxic substances. It is recommended as a suitable substitute for conventional forages such as alfalfa as an energy source for growing lambs at levels of up to 50% of the diet. Additionally, they suggest the high potential of amaranth as forage for ruminants. For human consumption, amaranth leaves and stems, or entire plants may be eaten raw or cooked as spinach or greens. As discussed earlier, cooking and discarding the water will remove potentially harmful oxalates and nitrates. Dr. Cheeke also pointed out that there are few raw foodstuffs that do not have problems. Raw soybeans contain 10 kinds of toxins; raw kidney beans kill rats, and yet cooking eliminates these problems. The key seems to be to use amaranth (leaf or grain) in recommended amounts, and to cook it. The seeds from grain amaranth can be ground for use as good quality flour for breads or pastries. It must be combined with wheat flour for yeast dough. The Organic Farming and Research Center (Rodale) has used a 50:50 ratio successfully, but suggests that the percentage of amaranth could be greater. They state that “amaranth flour contributes to the sweetness and moistness of a baked good. In a number of African nations, amaranth is becoming an important nutritious food in regards to treating those suffering from HIV/AIDS. It is known that on a poor diet, the anti-retroviral drugs function poorly or not at all. Often, the drug becomes a toxin in itself. Alternatively, amaranth seeds can be popped like popcorn. 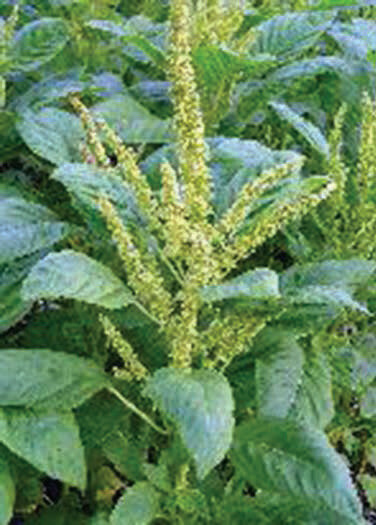 Rodale says that popped amaranth can be used: in confections bound with sorghum, molasses or honey; in high-energy granola and granola bars; in cheese spreads; as a condiment to flavor salad dressings; in breading for chicken and fish; in crackers, pie crusts and breads; and as toppings for casseroles and desserts. Sowing. 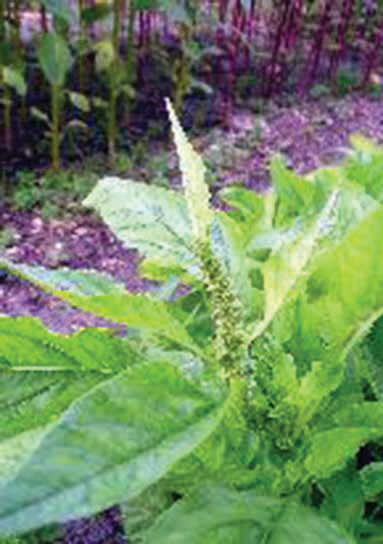 To initiate amaranth production, a well-worked, firm and moist seed bed is required. It is important to firm the soil over the seed to make good contact between the seed and the soil. Seed sown at a depth of 1.3 cm (0.5 in) or less in soil 15°C will establish a good plant stand. Seed will germinate within 3–4 days with a soil temperature of 20°C (68°F). When sowing vegetable amaranth, there appears to be considerable latitude in choice of plant densities. One approach is to plant dense stands at 5–10 cm (2–4 in) spacing, and harvest by uprooting when the plants are 5–7 weeks old. Another common approach is to sow less densely at 15–30 cm (6–12 in), and harvest by cutting the stem tips and tender leaves periodically beginning when the plants are about 15 cm tall (6 in) (4–6 weeks). Table 2. Growth parameters of amaranth at six in-row plant spacings (Singh 1993). p = 0.05 or 0. On a large scale, grain amaranth is direct-seeded into the field. Otherwise transplanting is subject to the same considerations for vegetable amaranth. Since amaranth seedlings are easily blocked from emergence by the soil crusting over after rain, it is important to select soil and management practices that will minimize crusting. A loose (but firmly packed), friable soil is preferred, and soil cultivation is essential until plants have reached around 25–30 cm (10–12 in) to prevent crusting and to shade out weeds. After plants are about 30 cm tall (1 ft), it is helpful to hill the soil from the centers of the rows up around the plants. This helps to reduce lodging (plants blown over in the wind), suffocates weeds around the plant, and uproots weeds between rows. A number of mechanical planters have been successfully used with amaranth. Some farmers using row crop planters will put the seed into the insecticide box, running a tube down between the discs to sow the seed. Grain drills have been used by stopping up the appropriate seed holes, and vegetable planters can be used with a celery plate. No-till planting has been done, but insects eating the seedlings were a problem. Transplanting. Seeds may be planted in a nursery for subsequent transplanting or sown directly where plants are to be grown. Transplanting is a very efficient use of seeds, and allows the growing area to be weeded just before the seedlings are transplanted. The very small size of the seeds, however, means that a few seeds go a long way. The number of seeds saved may not be a sufficient justification for the extra work involved in transplanting. On the other hand, gaining a two-week jump on the weeds could be significant because amaranth seedlings are not vigorous growers when very young. Planting in a nursery also reduces risk of loss due to disease such as damping off. Direct seeding involves much less labor, but incurs a greater risk of a poor stand due to diseases and predators of young seedlings and to poor competition with weeds in the initial couple of weeks. If direct seeding is used, sowing should probably be in rows to facilitate cultivation. Whether sown in the nursery or field, seeds need to be planted about 1.3 cm deep (0.5 in) (or covered with 1.3 of soil) for good germination. Because of the shallow depth, special care must be taken to prevent the soil from drying out until plants are established. Transplanting or thinning is crucial. It may be done within two weeks of when plants reach a height of 5–10 cm tall (2–4 in). However, any delay in transplanting, even for one week can reduce total yield. Soil Fertility. 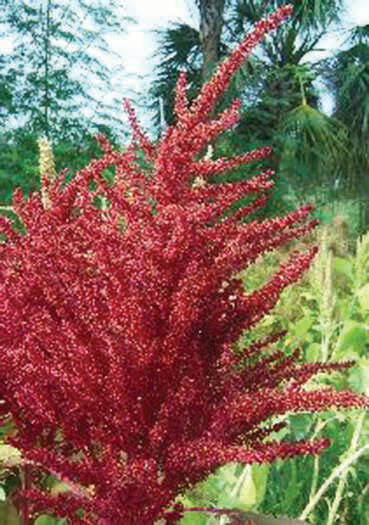 Amaranth does not have a high nitrogen requirement like maize, but responds well to fertilization. A leguminous cover crop tilled under prior to seeding will provide sufficient nitrogen for amaranth. Animal manure or chemicalfertilizer at a rate that supplies 135 kg per hectare (135 lbs/a) of nitrogen will also suffice. Use less when preceded by a leguminous crop such as beans or soybeans. A pH study comparing vegetable amaranth growth in 3 pH levels (6.4, 5.3 and 4.7) was conducted. (Singh 1993) Results showed the best growth at pH 6.4. Moreover, growth decreased with the increase in soil acidity. Stallknecht et. al. recommend soils with pH above 6.0. Environmental & Cultural Conditions. Getting a good, properly spaced stand can be difficult, and weed competition can be serious with young amaranth seedlings. 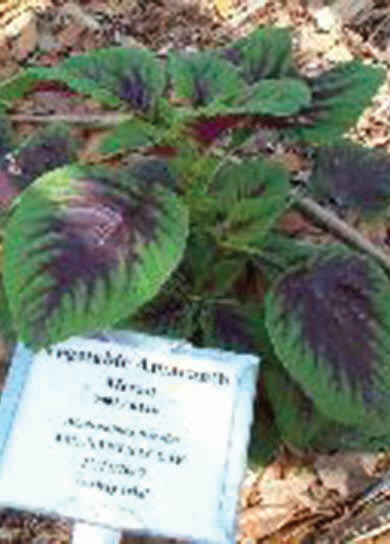 Amaranth tolerates full sun, droughty conditions and high temperatures. Optimal daytime temperatures range between 30 and 35°C (86–95° F) with optimal nighttime temperatures between 23 and 28°C (73–82°F). Grain amaranth is grown from tropical lowlands to 3500 m in the Himalayas. In the tropics, altitudes above 1000 m are considered best. Although it tolerates droughts and low fertility, it does much better under conditions that are considered ideal for maize (corn). It may be intercropped with maize, beans, peppers or squash. In the Andes, farmers often intercrop it with quinoa (Chenopodium quinoa) and other pseudocereals. In some pure stands, it has yielded as well as the world average yields for maize or rice (2000 kg/ha). Loss of the tiny seeds by shattering before or during harvest can be a problem. Amaranth, like other members of the amaranth family, tends to reseed abundantly, leading to potential weed problems. In places where few plants will grow without special care, this might be advantageous. However, caution should be taken that it does not become weedy. **Vegetable**. When harvesting by repeated clippings, a twoor three-week interval is common through the end of the season (usually the shortened days of the year). Both the yield and quality of leaves are higher with more frequent clippings. When the vegetative stage ends and flowering begins, subsequent harvests are lower in both quality and quantity. Short days, water or other environmental stresses may promote flowering. The stress that comes with delayed transplanting can also cause the plants to flower early. It is reported that cutting flower heads from the plant may prolong vegetative growth. Grain. Basically, amaranth grain must be threshed like it always has been done until the invention of the threshing machine. Three stages of harvest include (1) the drying of the heads, (2) threshing the grain from the head, and (3) winnowing the grain. Often local folks are very knowledgeable about such techniques. Drying. Cut the heads when the grain matures, and dry them under shade. Farmers in temperate regions wait until after the first hard frost to assist in the drying process. Regardless, if left too long before cutting, much of the grain may shatter (fall to the ground). Threshing. Amaranth grain easily separates from the dried head. Put a few heads in a cloth bag and beat it against the floor a few times to knock it loose, or strike the bags with a stick. Then place the grain in a 20-liter (5-gallon) bucket (many other containers would be suitable). You will notice that a lot of chaff accompanies the grain. This is where winnowing comes in. Winnowing. Place an empty bucket in front of a fan or any steady, light breeze and, cautiously at first, pour some grain and chaff into the empty bucket. A steady wind will accomplish the same thing as the fan, but a gusty wind may cause problems. The grain is denser and will fall closer to the fan than the chaff. Quickly, one begins to get a feel for how far the buckets should be from the fan, and at what height to hold the bucket to pour the grain into the fan and remove the chaff. Pour the grain back and forth until clean. Someone talented with the use of a winnowing basket can often speed up the process of cleaning the grain. Final cleanup can be done by swirling and shaking the grain gently. Remaining chaff will “float” to the top like ice in water, and can be removed by hand. The grain can then be dried and stored. Seed Production. The seeds are mature when they can be easily separated from the heads upon rubbing between the hands. Seeds can be chewed to test whether they have passed beyond the “dough stage”. Heads should be cut from the stalk and side branches as soon as possible after they have reached maturity. Heads should be dried as necessary, keeping green plant parts to a minimum. Once dry, the seeds are threshed from the heads, sifted through an ordinary window screen, and winnowed to remove chaff. Amaranth grain should be dried to 9-12% moisture for safe storage. It is reported that it remains viable for up to seven years. A. tricolor is considered more susceptible to pests and diseases than A. cruentus. In general, amaranth will contract some fungal diseases, particularly seedling damping-off disease caused by Pythium, Rhizoctonia and Aphanomyces spp. and cankers caused by either Phoma or Rhizoctonia. Various root and stem rots can occur later in the season if the soils are wet, thereby contributing to lodging. Alternaria leaf spot is the most serious foliar disease. Amaranth is generally considered tolerant of nematodes and is even recommended as a rotation crop to reduce nematode populations for subsequent crops. However, one article reports the presence of root knot nematodes on amaranth roots. Control of nematodes is such a serious problem that it is important to know whether or not amaranth can be used to control them and/or whether it can be planted where nematodes are a problem. We will include this question in our list of research projects that could be done at Christian colleges. It is possible that the discrepancy in reported results is because varieties differ in their susceptibility to nematodes. A lot of insects like chewing on amaranth leaves without it sustaining yield loss. A few insects however can inflict substantial damage. Amaranth can succumb to caterpillars, webworms, blister beetles, lygus bugs and stem borers. The lygus bug, coffee bug or tarnished plant bug (Lygus spp.) is a brown, lady-bug sized sucking insect that attacks flowers and seeds. It can cause substantial damage both by preventing flowers from producing seeds and by reducing seed weight. Solutions made from pyrethrum or synthetic pyrethrins will help control lygus. 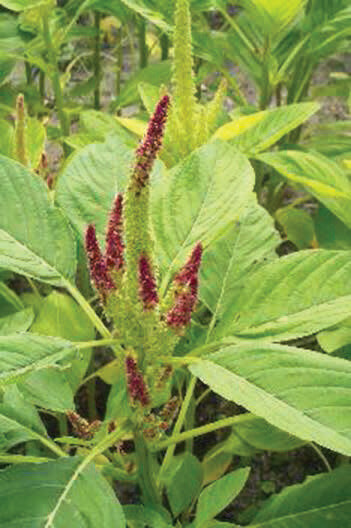 Other insects that can injure the developing amaranth include fall armyworm (Spodoptera frugiperda), cabbage looper (Trichoplusia ni), corn earworm (Heliothis zea) and the cowpea aphid (Aphis craccavora). The amaranth weevil (Conotrachelus seniculus) can damage roots, resulting in lodging or other root diseases. The potato flea beetle (Epitrix cucumeris) can damage seedlings and the beet leafhopper (Circulifer temellus) can transmit curly top virus, but this has been seen only in areas near large areas of sugar beet production (Stallknecht et al). 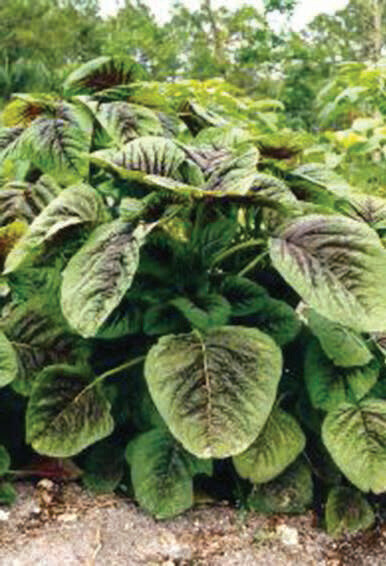 Generally, amaranth does not have problems with viruses. Acar, N., P. Vohra, R. Becker, G.D. Hanners, R.M. Saunders. 1988. Nutritional evaluation of grain amaranth for growing chickens. Poult-Sci. 67(8):1166-73. 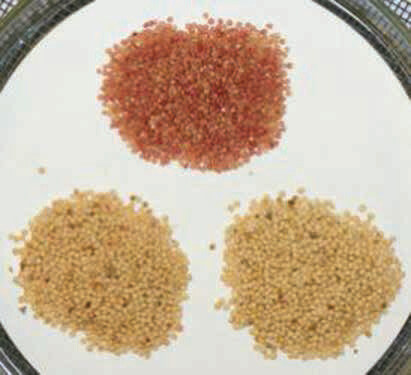 Amaranth Grain Production Guide. 1990. Rodale Press, Inc. Emmaus, PA, USA, 18049. Amaranth Round-up. 1977. Rodale Press, Inc. Emmaus, PA, USA, 18049. Amaranth: from the Past, for the Future. Rodale Press. Emmaus, PA, USA, 18049. Berkelaar, D. and J Alemu. 2006. Grain Amaranth. In ECHO Development Notes 91:1-5. ECHO, 17391 Durrance Rd., North Ft. Myers, Florida, 33917. Cheeke, P.R. 1983. Personal communication. Cheeke, P.R. and J. Bronson. 1980. Feeding Trials with Amaranthus Grain, Forage and Leaf Protein Concentrates. In Proceedings of the Second Amaranth Conference, 5-11. Rodale Press, Inc. Emmaus, PA, USA, 18049. Grubben, G. J. H., and O. A. Denton (Editors), 2004. Plant Resources of Tropical Africa 2. Vegetables. 63-89. PROTA Foundation, Wageningen, Netherlands / Backhuys Publishers, Leiden, Netherlands / CTA, Wageningen, Netherlands. Martin, F. and L. Telek. 1979. Vegetables for the Hot Humid Tropics: Part 6. Amaranth and Celosia. Agricultural Research, Science and Education Administration, USDA, New Orleans, LA, USA, 70153. Pond, W.G. and I.W. Lehmann. 1989. Nutritive Value of a Vegetable Amaranth Cultivar for Growing Lambs. Journal of Animal Science 67:3036-3039. Proceedings of the First Amaranth Seminar, July 29, 1977. Rodale Press, Emmaus, PA, USA, 18049. Proceedings of the Second Amaranth Conference. 1980. Rodale Press, Emmaus, PA, USA, 18049. Ravindran V., R. L. Hood, R. J. Gill, C. R. Kneale, W. L. Bryden. 1996. Nutritional evaluation of grain amaranth (Amaranthus hypochondriacus) in broiler diets. Animal Feed Science and Technology 63:1(4):323-331. Singh, B.P. and W.F. Whitehead 1993. Population density and soil pH effects on vegetable amaranth production. p. 562-564. In: J. Janick and J.E. Simon (eds. ), New Crops. Wiley, New York. Sooby, J., R. Myers, D. Baltensperger, D. Brenner, R. Wilson, C. Block. Amaranth: Production Guide for the Central Unites States, a Guide to growing and marketing. University of Nebraska Cooperative Extension EC 98-151-S.
Stallknecht, G.F. and J.R. Schulz-Schaeffer. 1993. Amaranth rediscovered. p. 211-218. In: J. Janick and J.E. Simon (eds. ), New Crops. Wiley, New York. Zraly Z., B. Pisarikova, H. Hudcova, M. Trckova, I . Herzig: 2004. Effect of Feeding Amaranth on Growth Efficiency and Health of Market Pigs. Acta Veterinaria Brno 73:437-444.